Affluent ethnic investors surveyed by Spectrem Group are far less likely to be retired than the general population of investors. Four-in-ten affluent African-Americans reported being retired vs. 52 percent of the general investor population. The gap is more pronounced among Asian investors (35 percent retired vs. 57 percent) and Hispanics (27 percent vs. 60 percent). These households are generally younger than non-ethnic investors, which accounts for why more are still working. They still have many financial decisions to make, one of the most crucial being retirement. While Americans of all races face retirement saving challenges, the problem is heightened about African-American and Hispanic households. A 2013 National Institute on Retirement Security report found that fewer than half of African-American and Hispanic workers have workplace retirement plans and that their average retirement savings account balances were four times less than those of whites. The majority of affluent ethnic investors surveyed by Spectrem Group consider themselves only “fairly knowledgeable” about financial products and investments with a great deal to learn. But the Spectrem Group study indicates that Hispanics and African-Americans surveyed are being most proactive about retirement planning. Among the surveyed ethnic investors, Hispanics are the most likely to report currently receiving retirement planning advice from either their own financial advisor or someone else (43 percent), while 16 percent indicated they plan to seek this advice, which is twice the percentage of the general population of investors. 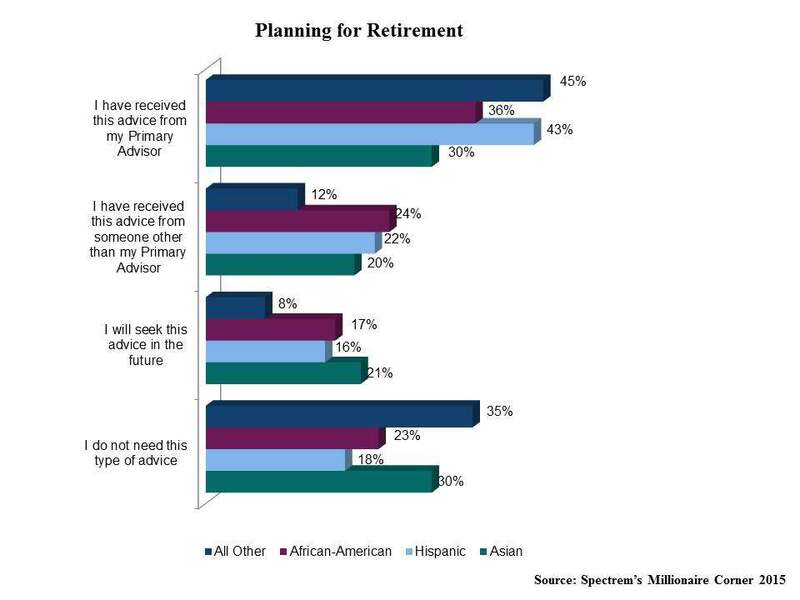 Affluent African-American investors surveyed by Spectrem Group were the next most likely to be receiving retirement planning advice (36 percent, followed by Asians (30 percent), who were the most likely to indicate they plan to seek this advice in the future (21 percent). Asian investors were more likely than their African-American and Hispanic counterparts to state they do not need this advice (30 percent vs. 23 percent and 18 percent, respectively).